Turn It Around, by J.P. Taylor, is the theme song of The Green Front. J.P. is a song writer, singer and Eco-Crusader on a musical mission to protect the planet. Today we air a rerun of the November 17 program with Kelly Coleman and Pr. John Abraham. 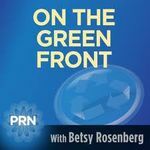 Gil Friend, founder and President of NaturaLogic discusses his book "The Truth About Green Business" as well as high and low points for the environment in 2010. The always knowledgeable author, speaker and consultant is optimistic, despite setbacks in climate legislation, that 2011 will bring progress on the green front! Betsy recaps her experience 'defending' global warming to the doubters on Fox TV who think the more it snows, the bigger 'the hoax'. Au contraire, this is what climate change looks like as you'll hear Betsy explain in this audioclip from the Sean Hannity television show on December 27th. Note how the deny-asaurs devolve to talk of alien spacecraft when they can't come up with any earthly explanations for extreme weather. And then they bring up the notion of "cognitive dissonance' - look in the mirror guys! Stephanie Bernstein, CEO of Togoware talks about their bamboo utensils and other products to carry around for your "to go" meals. Joseph Romm is a senior Fellow at the Center for American Progress. His blog is Climate Progress. He weighs in on the just concluded talks in Cancun. You'll hear why Bolivia went ballistic, Japan jousted over extending Kyoto Protocol and Mexico managed to save the day, and dignity, of U.N. climate negotiations which had derailed in Copenhagen and are now back on track. Debi Barker in Cancun: how to reduce our carbon footprint with our forks. Here is a first hand report from the UN climate conference in Cancun where a gathering of national representatives from around the world is in its second week of discussions. Debi Barker, International Director of The Center For Food Safety, tells us how the talks are progressing and what we as consumers can do - in the absence of government leadership - to reduce our carbon footprints with our forks! Erika Schreder: Hormone-disrupting Bisphenol A (BPA) on paper receipts and 95% of $20 bills. Erika Schreder, staff scientist with the Washington Toxics Coalition is the author of new research (pdf format) which finds a controversial hormone disrupting chemical, Bisphenol A (BPA) is commonplace on our beloved cash, and receipts. She explains why the color of money is NOT green, thanks to BPA! Kelly Coleman is the founder of Save The Rain - she’ll inspire you as she embodies the power of one person to make a lasting difference, one drop at a time! Learn how only $15.00 dollars can save a life - literally! Professor John Abraham of St. Thomas University in Minnesota about what climate scientists are doing to combat the disinformation and denial campaigns that have been 'heating up'. Ed Begley Jr was the MC for the 4th Annual Energy Oscars. Sally Bingham talks about the Energy Oscars. David Owen talks about his book Green Metropolis. Adi Nochur, Partnerships Coordinator with 1sky.org talks about the results of the midterm elections. Joel Francis, a college senior has issued a challenge to Tea Party financier, Charles Koch, to put his mouth where his money is with a debate about Prop 23! Here on YouTube. Koch has declined to meet with Joel. Samantha Feld is a recent college graduate who spent her summer biking across the U.S. to raise money and awareness for affordable, green housing. The Bike and Build program is growing, tracking both the bicycle and green building trends. Alex Beutel and Kayla Fratt are juniors who attend the semester long program at the Conserve School in Wisconsin. You'll hear how learning to be environmental stewards is shaping their career paths. Dan Shapley is editor of The Daily Green. He explains 7 scary truths about our world. The Living Planet Report co-produced by the WWF warns that a second earth could be needed by 2030. Nicole , communications officer with the Global Footprint Network explains why. Dave Roberts, journalist with Grist talks about the influence of the Koch brothers as investigated earlier by Jane Kramer in the New Yorker in her article Covert operations. Jamie is a co-founder of 350.org. He talks about the 10/10/10 Global Work Party that took place all over the world. George explains how Ecoplex is "the first mass produced modular trailer for use in natural disasters (and many other applications) that does not contain cancer causing toxins and is 100% recyclable". Jonathan speaks about his just published book American Wasteland. Could this be the week our President made an eco u-turn on renewable energy? It just may be a tipping point - or let's hope - for solar power. Just 24 hours after the Obama administration gave a green light to have solar panels installed on the White House next spring, President Nasheed, of the sinking Maldive Island nation, had the Sungevity company put solar panels on his official residence. Sungevity founder, Danny Kennedy, talks about the significance of these back-to-back developments. David Gordon talks about the lessons to be learned from the fires in Russia. Bridgett Luther of the Cradle to Cradle Products Innovation Institute talks about how they have joined the Clinton Global Initiative to help create safer products. Joe Laur talks about Greenopolis. Follow the oil and follow the oil money! That's the theme of today's program as we check in with Dr. Riki Ott, still at her command post in the Gulf of Mexico where several inches of oil have been discovered on the seabed floor between the site of Deepwater Horizon disaster and the coastline. We'll find out what that portends for the marine ecosystem as well as what's happened to fishing and tourism in the wake of the great oil kill. Proposition 23 on California's November ballot, is an initiative largely bank-rolled by three oil companies based outside the Golden State. David Hochschild, with the No on 23 Campaign joins us to pull the curtain back on this effort to reverse groundbreaking climate change legislation, and just when we need it most! Meet Leslie Sheridan, whose company, Planet Cents, is helping businesses pave the way toward a greener future. Eco-adventurer Roz Savage is back on The Green Front! Just back from Asia where she wrapped up her most recent row, Roz takes a few minutes out from working on a second book to share her unique wisdom and wit with us. The solo ocean rower has much to teach all of us about the power of one ("not just a drop in the ocean") and both her eco-exploits and life lessons will inspire you for years to come. Another water warrior, Marsha Pardee, joins us from The Turks and Caicos Islands to share her work protecting coral reefs and mangroves from resort development. You can help by Adopting-A-Mangrove and signing her petition - and all without leaving your computer, though she welcomes visitors to the Islands to visit their "adoptees"! mercury and other toxins cement plants can release. Given that cement plants are among the top three biggest contributers to methylmercury emissions this a big deal development! We talk with the attorney who led those lawsuits, Jim Pew, with Earthjustice. Diane MacEachern of The Big Green Purse is a longtime environmental activist who believes greenpower lies in our spending choices. She tells us about an innovative and hugely successful grassroots campaign to get grocers to carry more earth friendly products. Just in time for the great warming GM is taking orders for the all electric Chevy Volt and bringing back Detroit jobs in the process. Chelsea Sexton, EV consultant with a leading role in “Who Killed The Electric Car?” and the film’s upcoming sequel, “Revenge Of The Electric Car”. Joseph Romm is a senior fellow at The Center for American Progress and the author of Hell Or High Water. He reminds us of the huge consequences of global warming. On this, the 100th day since the worst U.S. environmental catastrophe began, we meet a finalist in the government’s search for a service that can best safely remove oil residue from Gulf state beaches. David McCallister is co-principal in a company called Environmental Solutions, that has developed a biodegradable, non-toxic clear substance that can be sprayed onto shores and easily removed, taking oil with it, without harm to marine life or humans. This is a Green Front exclusive as David’s company awaits final word in a bidding process which included some 3,600 applicants! Bruce Blanning is Executive Director of Professional Engineers In California Government, the sponsor behind a great new documentary called The Next Frontier: Engineering The Golden Age Of Green that depicts what’s possible with clean energy. Rachel Finlay Ginis is a LEED-accredited building contractor, designer and founder of the Citizen's Climate Lobby in Marin County, California. She is just back from Washington DC where she met with dozens of legislators to lobby for a strong energy bill that includes a new carbon policy concept known as “fees and dividends”, a better alternative to “cap and trade”, from a practical and political perspective. Julia Whitty, just back from the Gulf Coast and just in time to launch her new book Deep Blue Home. Whitty is passionate about our need to wake up to the gifts of our seas and to ‘seize’ the moment of this oil catastrophe to make a sea change!